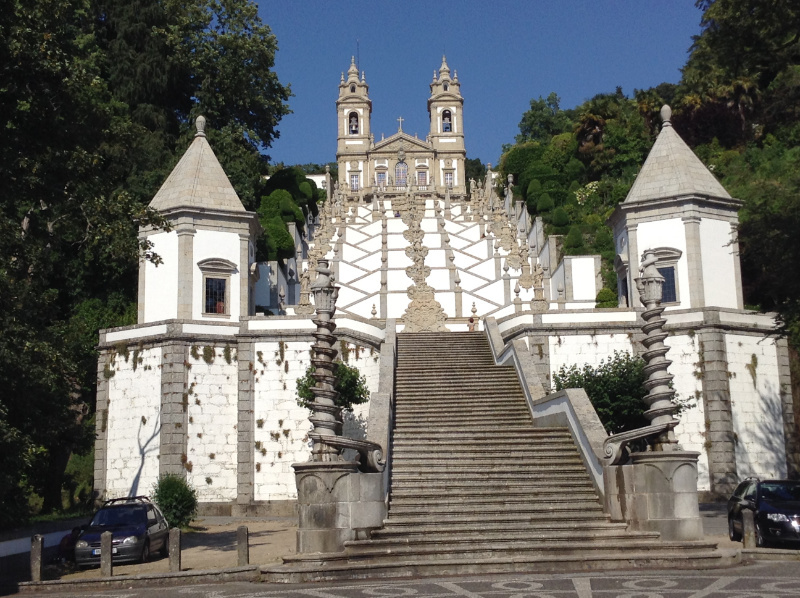 Dominating the hill above Braga, the church of Bom Jesus has long been a centre of pilgrimage in Portugal, though today's devotees take an easier route up than they did in the old days – and those old days are not as far back in the past as you might think. To find out what earlier pilgrims, including the hypocritical one mentioned in the title, used to do, click here. Most people drive up to the sanctuary today but even in the early 1990s, when I first visited Bom Jesus, there was no actual need to walk the asphalt road or climb the zig-zagging staircase to the top. There was always the option of an antiquated, hydraulically powered cable car which carries pilgrims and visitors up or down twice an hour. In the past, however, taking the easy way up would have been unthinkable for the true believer; there was a much more demanding way to show your devotion, expiate your sins or seek a blessing. Twenty-five years ago, starting out on my exploration of the region, I felt that there could be no real understanding of northern Portugal without engaging with the deep, unquestioning faith of the people. They performed a ritual there of a kind completely unknown in the part of the world where I come from and which would have been regarded in practical Yorkshire with grave suspicion. Nevertheless, I was in Portugal and I decided to take part. However, I wasn't looking for such religious or secular appurtenances as I prepared for the morrow so I turned off down a side-street, where I found what I was looking for: a general hardware shop. I purchased a couple of thick sponges and two strong dusters and went off to get a good night's sleep. Next morning, embarrassed by what I was about to do, I set out early to avoid the crowds, caught a bus up to the stepped entrance and towers at the base of the hill, took out my sponges and cloths and bound them to my knees. Then, like uncounted thousands before me and many who would follow later, I began to crawl laboriously up the winding pathways, through the woods, towards the monumental staircase. This is not an experience I would recommend to anyone. 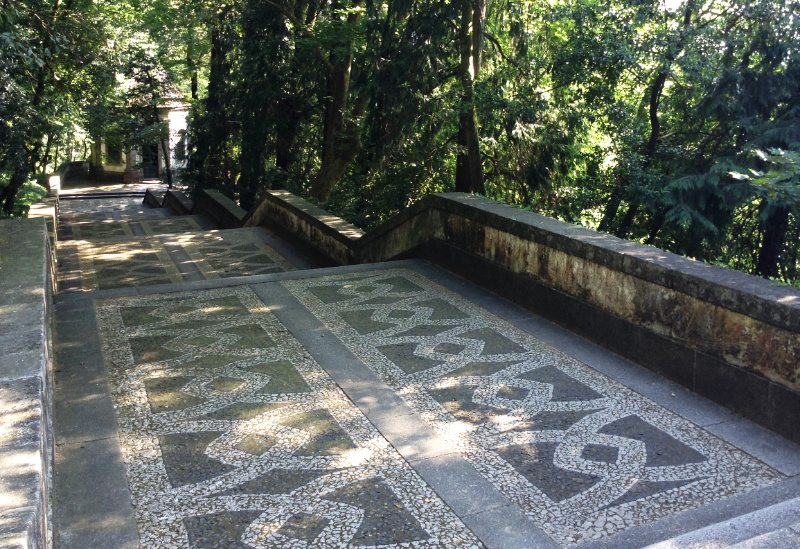 As you can see the pathways are decorated in typical Portuguese fashion with patterns made from black and white stone setts. Every little cobble has pointed corners and sharp edges and each one easily penetrated my sponges and dusters to jab into my knees. If ever you feel the urge to copy me – and I really cannot think of any reason why on earth you would, especially as in the 21st century no-one seems to do this today – a piece of advice: try to keep to the large stone blocks in the centre. They are hard but there are no sharp edges or points! Up I crawled, trying not to think of the dire damage being done to my really quite new shoes – the scraping off of the leather on the toes was a side effect I had not thought of! 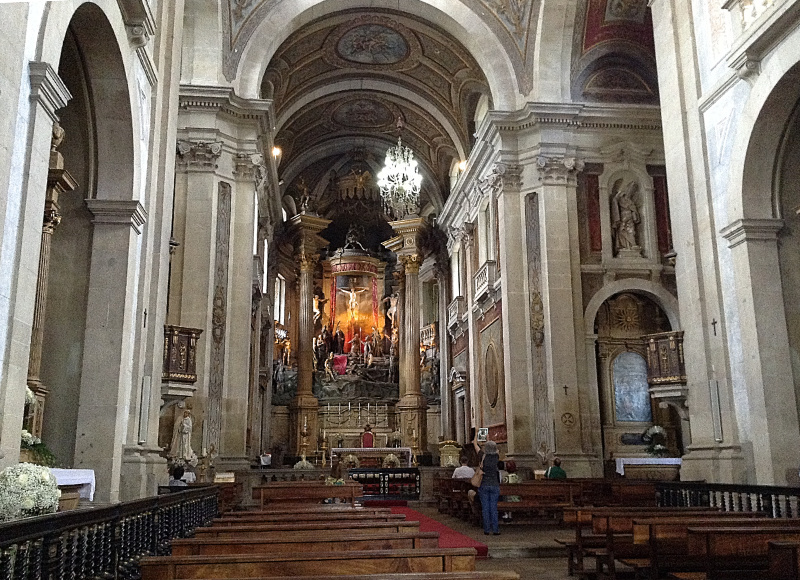 - stopping at each dusty chapel to look at the stations of the cross. Unswept and unkempt, these chapels were hugely depressing. On trays just inside the iron grills protecting the windows, long-ago-guttered candles languished amidst filthy melted wax. Things are no better now. I recently poked my camera through the bars and tried in the dimness to take a photo. Here, for example, we have Christ being mocked with a crown of thorns. Then, as now, the padlocks looked so little used that I found myself wondering if anyone knew where the keys were and if the chapels were ever cleaned. Soap and water would do wonders – but then the flaked paint and chipped plaster might show up more. I was nearing the top of this section of my personal Calvary when I heard a "Psst', which I thought must be coming from amongst the trees to my left. As at that time I knew no-one in the Minho, I was sure this was not to attract my attention. But it came again more insistently and then a third time, longer and louder: "Psssssst". I looked up and there in the dappled shadows was a man in a coat – it might even have been a raincoat – which was gaping open and I saw a flash. It wasn't a flash of sunlight, nor of inspiration. I'll leave it to you to guess what kind of flash I saw. And so it seemed to me then that my hypocrisy as neither a Catholic nor a religious person had been exposed just as something else had been. 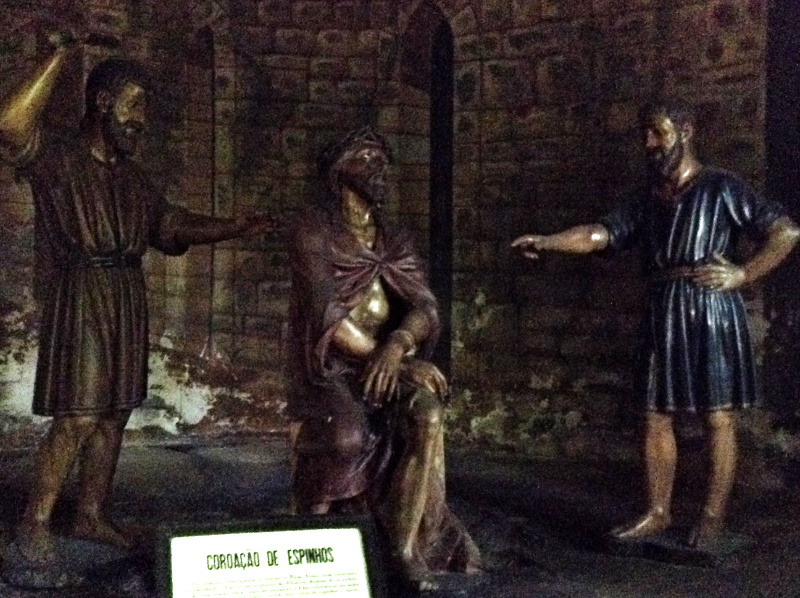 I wonder what Portuguese women – it seemed to me that the penitents were always women – made of the local pervert taking advantage of a virtually captive audience? Did the faithful, who in those days performed this arcane ritual to fulfil a vow or seek some kind of spiritual or worldly preferment, benefit from the experience? As already noted, I certainly gained no spiritual uplift, in fact rather the opposite, so I decided I might as well abandon my bizarre experiment, get up off my knees and walk the rest of the way. So in a more normal fashion, huffing and puffing, I climbed the zig-zagging staircase to the church at the top of the steps. Today I have seen no sign of people doing penance and crawling up the steps while on pilgrimage. The Portuguese, even the rural poor in the most out of the way corners of the country, are so much more sophisticated now. The church too has changed since my visit 25 years ago but first let me show you the inside of the sanctuary itself. Behind the altar, where in the UK you would usually find a stained glass window, is a 3-D depiction of the crucifixion. To the right, half way down the nave, you can see the opening to a side chapel, which is dedicated to a Roman soldier who became a saint and whose bones, encased in glass, lie beneath the altar. It is now roped off but when I first went you could go right up to the altar, which looked to me like a charnel house covered in bleached bones and scraps of paper. There were hearts and kidneys, thigh bones and fingers – pretty well every part of the body you can think of – all made from white wax. Coming from a protestant upbringing, even though I knew they were bought to be offered in prayer for an improvement in health or in thanks for the cure of an ailment I found this distasteful. The ragged-edged scraps of paper came from whatever people could find in their pockets or handbags. There were messages written on old pages ripped from diaries, napkins from the last meal out, the unused ends of letters, or blank bits from the edges of newspapers. They were written in a host of languages, some of which I knew or recognised: Portuguese, Spanish, French, German, Italian... and many whose provenance I could only guess at. I read a lot of them. Many were heart-wrenchingly touching: "Thank you for curing my painful feet." "You got me through my heart attack. I can never thank you enough." "Please help me with my exams." "Can you make my husband love me again" and so on. You can, and almost certainly will, mock my curious experiment in trying to enter the mind-set of the provincial, religious Portuguese of the early 1990s but you cannot mock the heart-felt pleas and thanks of people who could find help nowhere except in the church. Comfort is still found there today. 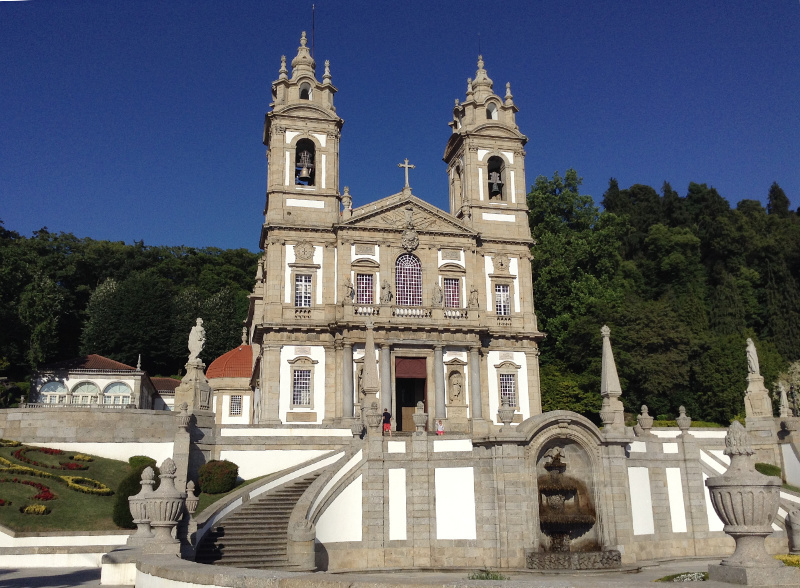 If you visit Ponte de Lima parish church at almost any time of day you will see people just popping in on their way to the shops or going home from work. They carry their rosaries, say a prayer and feel relief. All that said, the juxtaposition of the sacred and the profane at places of pilgrimage never fails to amuse me. 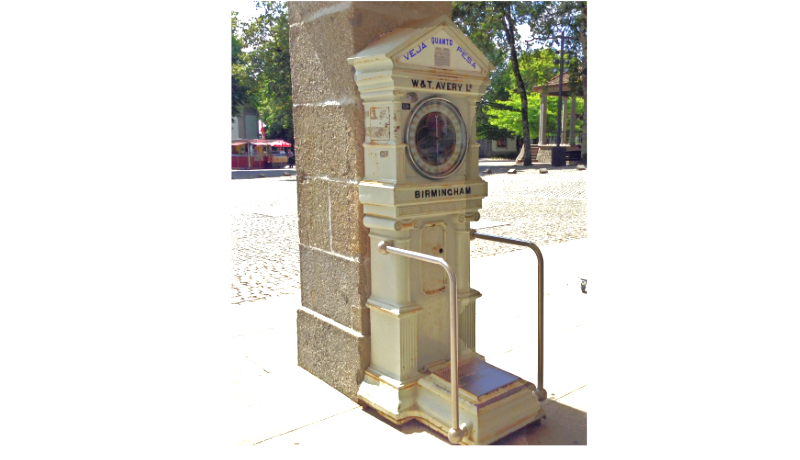 Just outside the sanctuary, next to the shop selling religious artefacts and souvenirs, is a weighing machine with W & T Avery, Birmingham written on it! I didn't bother to weigh myself all those years ago because it wasn't weight that I'd lost, it was my dignity! Oh, and by the way, I took the cable car back down to the bus stop! What a shock that must have been - I hope the pervert got well and truly smote for that. Glad I drove up, although to be honest, even the thought of walking up those steps was too much for me. To be honest I don't think I should have embarked on the enterprise in the first place so I suppose I got my just desserts. I certainly wouldn't do it now, pervert or no pervert, but at the time it seemed an interesting idea to find out what Portuguese penitents experienced. 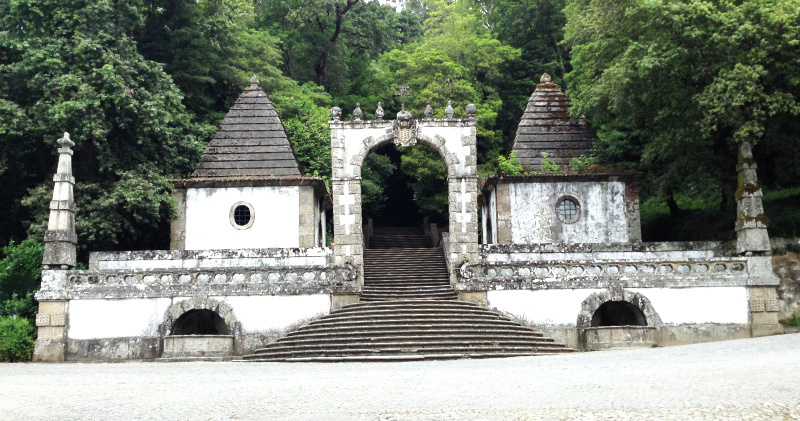 By the way, I should have thought that the person who can walk to Santiago could have climbed the steps to Bom Jesus! I certainly know which one I would find easier! I admire you for walking the 'caminho', though.